The Liberation Tigers of Thamil Eelam Friday released from their custody a Sri Lanka army soldier who had crossed the line of control dividing areas held by them and by Colombo. The soldier, Shalitha Pradeep Kumara Hettiarachchi,28, of Warakapola, 68 kilometres east of Colombo, was handed over to the International Committee of the Red Cross in Kilinochchi. 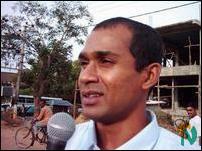 ICRC brought the soldier and his mother to Vavuniya Friday. Speaking to local media, the soldier said that he crossed the line of control about a month ago to see the peace situation in the LTTE controlled areas of the north. He said that the Tigers did not treat him like a prisoner but looked after him well. However, his mother said that her son was not in good health and that he had gone missing sometime after he had left the army. 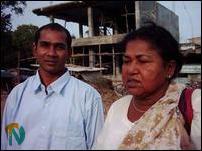 She got him released with the assistance of the ICRC when she went in search of him to Kilinochchi, the soldier's mother said.